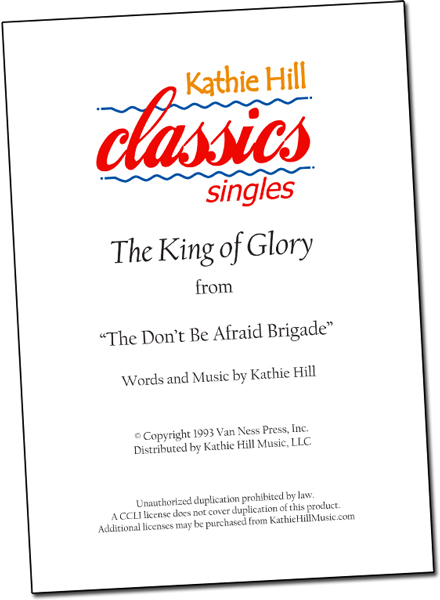 Who is the King of Glory * : Kathie Hill Music, LLC, Making music with and for kids for over 25 years! This classic worship song from The Don't Be Afraid Brigade is drawn from Psalm 24 and helps children understand who God is and how he was worshipped in the Old Testament. The call and response format depicts how this praise song was used in Bible times and creates an energetic exchange between soloists and/or groups. A copy of Psalm 24 and explanation of how the song can be introduced to children is included with the printed music. Voicing: solo / 2 pt. Your browser cannot play this audio file. Download and play the file on your device. Downloadable PDF (ZIP file) of sheet music with piano transcription and license to make 3 copies . Additional copies require purchase of additional 3x license/s.